After fascist governments were elected in EU member states Hungary (Fidesz) and Poland (PiS), in November 2016 Donald Trump was elected as US president. In contrast to the easy transition of the fascist Fidesz und PiS governments in Hungary and Poland, Donald Trump’s election was followed by massive protests and some initial acts of resistance. These are few thoughts from Europe. The rise of fascist movements isn’t exactly new, but they are taking power in more and more countries now. Last year Rodrigo Duterte was elected in the Philippines, since then thousands of people have been killed after president Duterte officially announced to kill drug addicts and dealers during his inauguration speech in July 2016. But there are many reports about people looking “different” like for instance people with long hair (“hippies”) and government critis are also being killed. Death squads are killing people on the streets in the Philippnes without any form of trial. In a speech in Davao City, Duterte compared his “restrictive measures” against drug addiction with Adolf Hitler and the holocaust (Duterte doesn’t even know the facts and said Hitler killed 3 million jews, but actually the German nazi regime killed 6 million jews in the 1940’s) . The world is watching and allowing Duerte continue to kill people on a massive scale. Even the Communist Party of the Philippines is only critical, and has for the most part kept a cease fire agreement with the government. Apart from the fascist governments in Hungary and Poland, there are several European countries where fascists could take power this year. In the Netherlands the PVV is leading the polls and Marine Le Pen (Front National) could win the presidential elections in France. In other European countries, fascist movements are growing as well. But even the “old traditional” parties who are governing EU member states installed border regimes that killed more than 30,000 people in the Mediterranean sea and along other EU borders. On top of that, EU member states force refugees to live in deteriorating conditions in countries like Greece, where refugees are trapped because of border closures. Fascist parties like the German AFD might not come to power in this year’s general elections, but they’ve already managed to shift government policies to sharpen asylum laws and increase deportations to warzones like Afghanistan. Many of the mass media outlets considered that “terror has come to Germany”, after an islamist drove with a truck into a crowd at a Christmas market in Berlin. But terror isn’t exactly new in Germany, the fascist terrorist group NSU killed many migrants in the last decade, and in the last 2 years there has been an average of 1000 attacks per year against refugees and other migrants. By saying that terror has come to Germany after the islamist attack in December 2016, many media outlets are ignoring the wave of fascist terrorist attacks that hit Germany in the last years. And unfortunately Germany is not an exception. This is the world we are living in, and this is the world where Donald Trump and his team have now taken the White House. This is also what liberals have to understand; Capitalism kills and will continue to kill. Trade treaties in favor of the west, military interventions and the export of arms have killed millions of people since WWII. Capitalism causes structural violence on several different levels. The rise of fascist movements will escalate these kinds of things. Apart from the fact that many people in the U.S. were killed by racist cops before Trump took power, the fact that fascists took the White House will make things a lot worse. 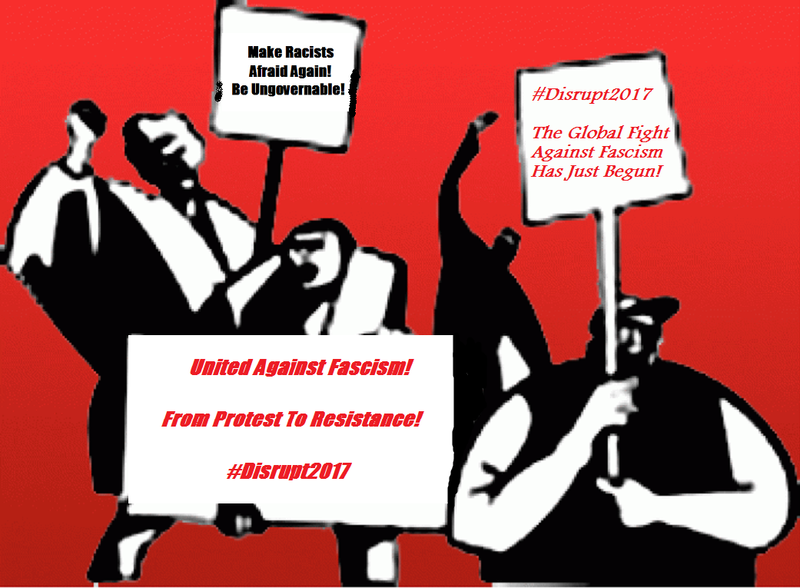 In “Antifa 2017: We need to talk” part 1 and part 2, I already published some thoughts about the fight against the growing fascist movements. These were just a few thoughts about the fight against rising fascism around the globe, but we have to start somewhere. It was good to see that there was a wave of protests across the U.S. immediately after Trump won the election in November 2016. Some of the protests in November 2016 were accompanied with direct actions, walkouts and clashes with police forces. The mobilisation for #DisruptJ20 started almost immediately after Trump was elected on November 9. Comrades who resisted that day may be paying a very high price for their bravery, as over 200 people are being charged with ‘felony riot’ charges. They’re all looking at up to 10 years in prison, and some of them are journalists. You can support those comrades by clicking here. History shows that protests alone are not enough. In 1932, 100,000 people in Berlin demonstrated against the Nazis. It didn’t stop Hitler and his NSDAP party from killing millions of people. Big demonstrations against fascism are important, but they will not stop nazis as they are just a way to express opnions and to show many people share the goal of the demonstration. For me, the #Womensmarch with millions of people around the globe was an important sign and a good thing, but it can only be effective when it’s considered as a first step to show people they must not accept the presidency of Donald Trump and the team behind him. No more, no less. Image: Demonstration against fascism in April 1932 in Berlin. Not everybody seems to understand this, and not everybody seems to understand that white nationalists managed to shift debates to push forward their political agenda. In Germany, racist views are more and more considered as “just another opinion”. AFD fascists are regular guests in prime time talkshows on national television to spread their racist views. The fascists of the “alt-right” in the U.S. are following the same strategy, and until now their strategy has been pretty successful. The fascist men and women of the far right in Europe, often trivialised as “rightwing populists,” are supported by fascist movements who spread terror on the streets; people of colour being threatened and beaten up, arson attacks, bombings, attacks against women, queer people, homeless people, refugees, other migrants and people who have different opinions. Personally I have received death- and other threats by fascists more than once in the past few years. It didn’t silence me, but it convinced me even more that we will not be able to stop these thugs with just a banner in our hands. Fascists will not be stopped by marching through the streets with banners that show that people disagree. Fascists kill! Social change will also not come by electing a more leftwing government. There are enough examples for that: In Chile, Allende and his government were brutally replaced by the fascist general Pinochet, a classic military coup which was at least backed by the U.S. and other western states, the “left” Syriza government in Greece betrayed about everybody who voted for them and social democrats betrayed their voters again and again in many countries. Hillary Clinton would not have brought any kind of real social change or a revolutionary change in climate policies to name just 2 important issues. That didnt stop Bernie Sanders from supporting Hillary. This is what liberals need to understand. The #DisruptJ20 actions and protests showed some encouring signs. The walkouts at universities, the shutdown of parts of the harbour in Oakland, other walkouts and the direct actions of the Black Bloc in several cities on January 20th were steps to move from protest to resistance. Some liberals started to cry-out when Richard Spencer was punched in his face in DC, but the activist that did this accomplished more than many people might think. Richard Spencer, well-known for his racist views, will have to finance bodyguards in the future. The punch in his face seem to have scared him so much that its more difficult for him to move and spread his racist views. Other fascists might considering to stay of the streets without bodyguards as well. We need diferent forms of resistance and daily resistance in our own neighborhoods, but we will also need more people to get active in groups that defend these neighbourhoods against fascist attacks. Against sexist, anti-semitic and racist attacks. The variety of our methods and our determination to defeat the fascists and to fight for social change will be decisive. Than its not enough to fight fascism, we also need to fight for social change, as the capitalist system is the breeding ground for fascists. As long as we accept the notion that constant competition is a good thing, there will be fascism. We need to stand up and unite. Also with people in other countries. We need more than an exchange between people in different countries, and eventually must try to create a united front against fascism and capitalism without state borders. No borders, no nations should not just be a slogan, but absolutely must become part of our daily lives and experiences. Next post: #NoDAPL Means No Surrender!